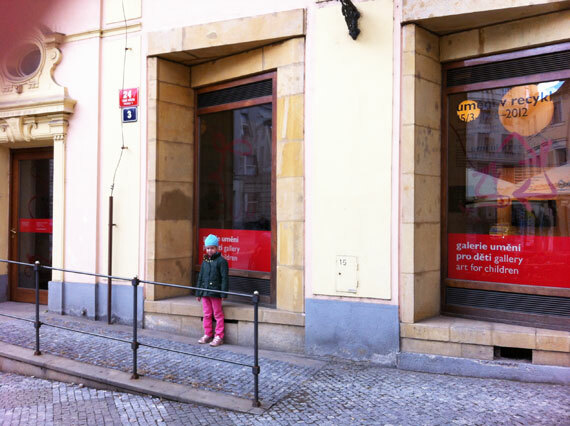 Galerie umění pro děti translates as Art Gallery for Children and that is exactly what it is. 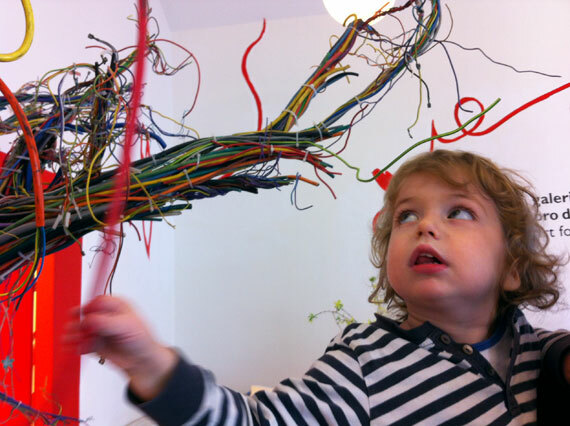 Kids are encouraged to be themselves, they can touch, talk and even create and alter the art installations that artists have created. Currently, the gallery is running a show featuring contemporary art pieces made completely out of recycled materials, this show will run until 17 June and then be replaced by a new series of works. The location is very central, just off Starometske Namesti (Old Town Square) and appropriately it’s on the ground floor of Franz Kafka’s house. The gallery is very new (it opened in March), there is a ramp for entry and even a locker room for coats, bags and strollers. The reception area of the gallery is where you pay and it’s also where quite a few works are featured including a tree made completely out of cables and various portraits. Some of these portraits are interactive either moving when you wave your hand in front of them or they have buttons which kids can press to hear different sounds. 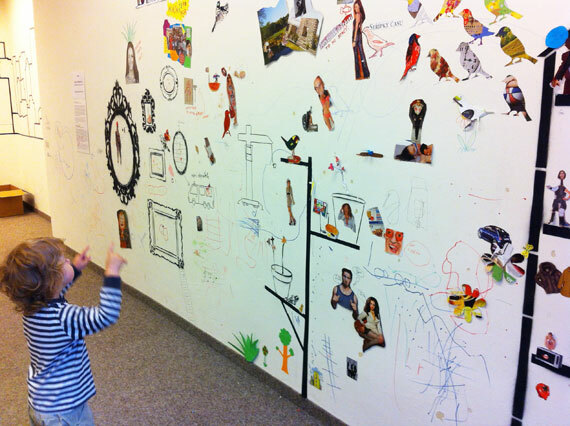 From the main gallery there are small rooms leading you past the installation pieces where your children can get physical with the works. 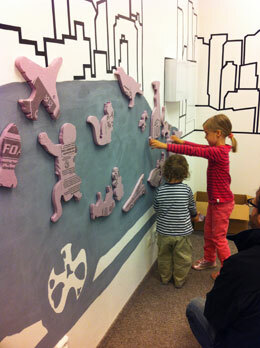 The first is a cityscape with various foam pieces with magnets attached that children choose and place on the wall - the idea is that you sort out the shapes that belong in a city - cars, airplanes etc. maybe ducks, birds too - it’s up to the kids to decide. Following that are two walls, one with a nest, another with a building created out of masking tape. 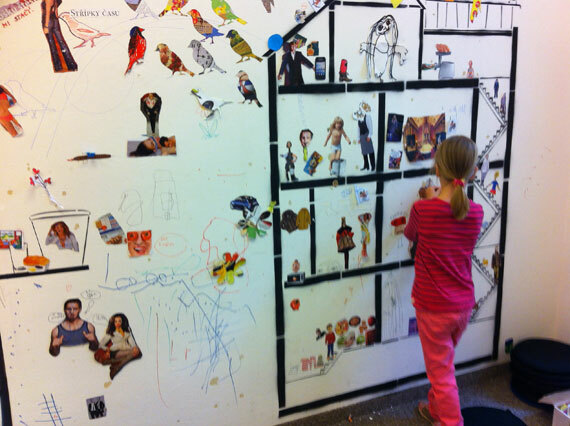 Children use colored paper or magazine paper and either cut an image out or choose one of the stencils provided to create their own figure or a bird. They then choose where to place their masterpiece. Pens, glue, scissors and blue-tak are supplied and when finished the kids choose where their artwork will be positioned amongst the collage that other children have added to over the past weeks. Nearby a video runs on loop, it’s a doco in English about our overuse of plastic bottles and how this is harming the environment. 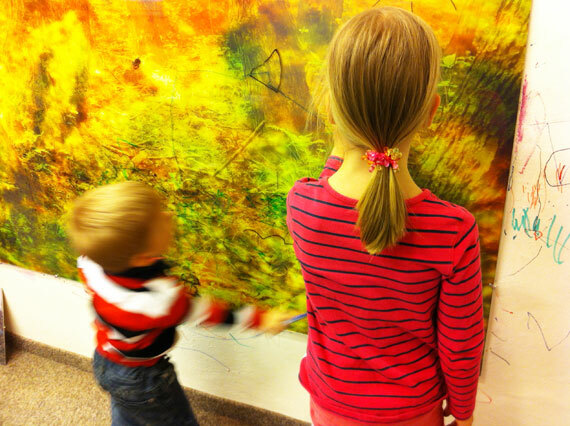 The next room features landscapes which are covered by glass, children are encouraged to use pens and add in their own creatures - can you imagine their glee having such free reign in what would normally be regarded as quiet and revered space? The final space is the icing on the cake - a room featuring beautiful fir trees, you can smell them as you enter. 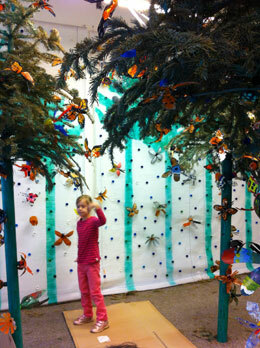 The trees are covered with children’s artwork - namely plastic bottles remodeled to create gorgeous butterflies and flowers. 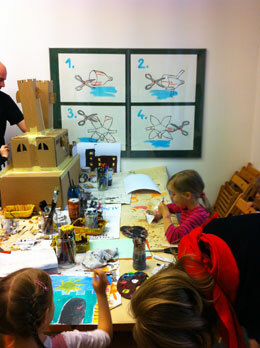 Instructions are on the wall and all materials are supplied on a large craft table in the room. Wow, Lucie just loved this part so much - we made 2 butterflies and 1 flower and spent a good 45 minutes or more cutting, painting, decorating and positioning our work in a specially chosen place. It was genius how these creations were hung. 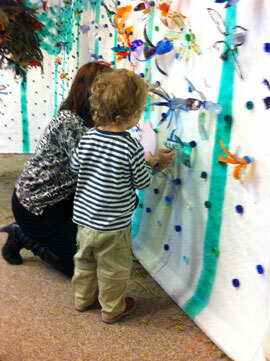 Bottle tops were glued to the tree branches, stems and the walls surrounding the installation. 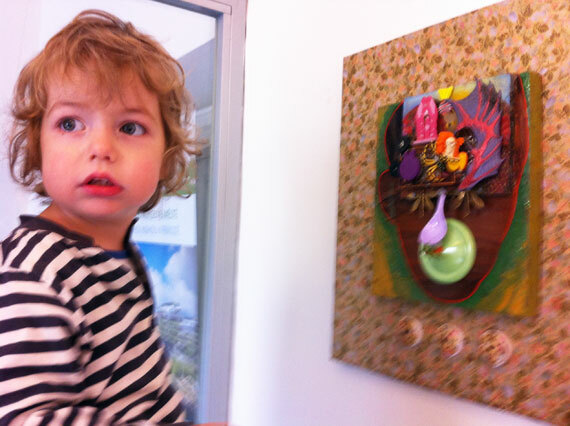 You basically choose a free bottle top and then screw in your art piece - voila! The gallery runs weekend workshops for kids (at 10am and then again at 2pm) run by artists, the weekend we were there a Cartoonist was running a workshop. In April they have quite a few Easter themed sessions running, you’ll find details on their website (only in Czech). The gallery staff were very friendly and spoke good English so I don’t think it would be a problem to join one of the workshops. 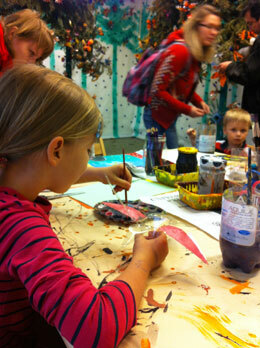 The workshops run for 2 hours and the recommended age for workshop participation is 5 to 12 years old. 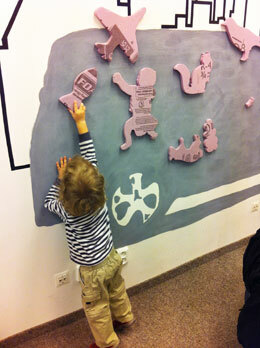 In summary, the gallery is not huge but it’s well organized and my kids loved it, especially Lucie who is almost 6. We spent a good hour or more there, particularly in the back room. It was perfect for the unpredictable weather we’ve been experiencing plus we were also able to visit the Easter Markets afterwards. DIRECTIONS: By Metro: Take the green A line to Staroměstská or the yellow line B to Mustek and walk towards Starometske namesti. By Tram: Take tram numbers 17 or 18 to Staroměstská.